Monroe, NC (5/16/2018) - Mills3 Racing kicked off the 2018 short course UTV racing season, running competitively in the Midwest SXS Spring National at US Air Motorsports Raceway in Shawano, WI. 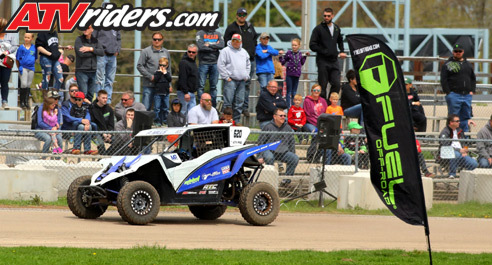 The Mills team used the special non-points event to shake down its Yamaha YXZ1000R’s for the Lucas Oil Midwest Series. The two-day event was organized by CJ Greaves, Johnny Greaves, and Rodney VanEperen and is set to become a traditional kick-off to the Midwest off-road racing season. It was held on a circuit that combined the facility’s competitive asphalt racing circuit with a dirt short course built by Greaves Motorsports. Though the team fought a few mechanical gremlins during the weekend, they did put in some solid runs in the Pro Modified class. The team also unveiled new colors on their cars that match their transporter, as well as returning sponsor Fuel Tires and Wheels. Liqui Moly, Addict Racing Engines, All Terrain Communications, Rugged Radios, FTI Suspension, and Yamaha all returned to the Mills program along with many other great sponsors. Payton Mills’ father, Chris, complimented the organizers for a successful event. He especially appreciated the out-of-the-box thinking that went into holding a race on an asphalt and dirt circuit. Payton Mills also enjoyed the track. The event turned into a driver and setup weekend, and he enjoyed working on the cars all weekend and going faster every session. Chris Mills was happy to see the competition is going to be stout during the season. With all of the top drivers in short course UTV racing in attendance, the Mills are ready to excel when the season gets underway next month. Mills3 Racing will kick off its Lucas Oil season at the Midwest Series opener at Crandon International Off-Road Raceway in Northern Wisconsin. That race is scheduled for June 15-17. Lucas Oil replaces the TORC Series, which announced it wouldn’t stage any races in 2018.